Situated in central Clarks Summit, this hotel is a 2-minute drive from Abington Shopping Center. 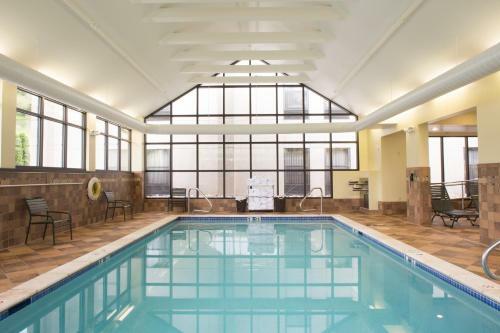 It features an indoor pool and offers rooms with a flat-screen TV and free Wi-Fi. Every room at Hampton Inn Clarks Summit features warm colors and traditional décor. The spacious rooms include a seating area and a work desk. An in-room coffee maker and a hairdryer are also provided. Each morning at the Clarks Summit Hampton Inn begins with a breakfast buffet featuring fresh breads, fruits and cereals. A packed breakfast is also available. Hotel guests can relax at the pool. The hotel also offers an on-site fitness center and business center. Scranton Country Club and the Houdini Museum are each a 7-minute drive from the hotel. Baptist Bible College and Seminary is just 2 miles away. the hotel Hampton Inn Clarks Summit so we can give you detailed rates for the rooms in the desired period.